A poll by the British Heart Foundation found that more than a quarter of parents admit to throwing away toys that are in perfect working order. It spoke to more than 2,000 people and found children have an average of four toys they've never played with. Lauren Tedaldi says her three-year-old daughter Mirella gets given loads of toys from friends and family. "Whether it's Easter, Christmas or birthdays it always seems to be an excuse to buy new toys." "Try as we might to buy wooden toys, or things that are a bit more durable, or that are better for the environment, my little girl loves plastic toys. "Like most kids, the brighter and the crazier - the better. "We try to save the big toys for special occasions, but it's hard and it's easy to end up with lots and lots of toys. "Lauren says she does try and take a bag of old toys to charity shops regularly and has a "one-in, one-out policy" when it comes to toys in the house. "I know charity shops can recycle what they can't sell. "I would never just throw toys away even if I was questioning if they were in good nick." Can toys ever be environmentally friendly? Whilst we don't know exactly how much of the plastic that ends up in landfill comes from toys, green campaigners say that consumers can help reduce the amount in circulation.Friends of the Earth says there are ways to cut back on buying plastic toys - things like toy libraries, passing toys on, buying less, borrowing off friends and sharing more.Greenpeace UK told the BBC it doesn't count plastic toys as 'single-use plastics' as they can be used time and time again. How easy is it to be more environmentally friendly? "Toys are far from single use plastics, as we know from research that they stay within a household for approximately 10 years and tend to then be passed on to charities, friends and families," Natasha Crookes from the British Toy and Hobby Association says.The organisation claims many toys will last between 15-20 years before they enter the waste stream. Making toys out of recycled plastic might not be the answer either. "Recycled plastics are rarely able to be used in the process of manufacturing toys due to the uncertainty of the chemical composition of recycled plastic," Natasha says. "It could contain one of the thousands of chemicals restricted under toy safety legislation." Avoiding plastic altogether and buying toys out of sustainable materials could be the answer. 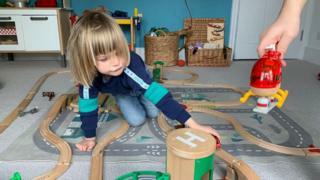 There are loads of new eco-style brands that offer toys made from sustainable wood and recycled materials.But they can be expensive.Mum-of-two Rachel Lochhead says she tries to stay away from plastic toys if she can help it and only buys "good quality" toy brands new so she knows they will last a long time. Rachel says she does buy some plastic toys but only second hand ones - mainly from Ebay or Gumtree and charity shops. "Plastic is a practical material and cheap to manufacture so inevitably lots of things are made from it." Bettina Maidment tries to live a plastic-free life.When it comes to toys though, she says she still buys plastic, but only second-hand. "For the last two Christmases I've done a second-hand Christmas - I save quite a lot of money that way. "My son got a bike for his birthday which we couldn't afford brand new, but second-hand it was like new and he loves it. "It's not just online auction sites that have grown in popularity when it comes to reselling toys, parents often post ads on social media groups offering up toys for free or a small price. How safe is it to buy second-hand toys? There have been some concerns about the health risks of buying second-hand toys.Last year a study found some toys tested didn't meet the most up-to-date safety guidelines. Mark Gardiner, of the Chartered Trading Standards Institute, said: "Any goods that are bought second-hand are not going to have the same safety assurances. "Parents should weigh up these risks, especially when giving their children toys that are very old and could have also mechanically deteriorated over time." What are the toy companies doing about plastic? Whilst consumers are taking steps to reuse or recycle toys, green campaigners say it's up to manufacturers and retailers to act. Some toy companies are taking steps to become more sustainable. Lego's leaves, bushes and trees are now actually green - they're made with plastic sourced from sugarcane.It's part of the Danish company's pledge to use sustainable materials in its products and packaging by 2030.Toy company MGA Entertainment, which is behind L.O.L Surprise!, is trying to cut back on the waste produced from packaging its dolls. Consumers are invited to box the waste up, request and print a label from the website, before sending it off to TerraCycle for recycling. How easy is it to recycle plastic toys? Rather than chucking out an old plastic train set if it's damaged, it's worth checking with your local recycling centre if they'll take it.Plastic toys and games can't be collected as part of your household recycling scheme, according to the Recycle Now campaign group. "If your toys and games are beyond repair, it may still be possible to recycle some of the parts if you dismantle them - and this includes batteries and battery packs from remote controls which should be removed and recycled."